BASEL, Switzerland — An art fair like the one here this week can feel as hermetic and all-consuming as a casino, so focused are the crowds on buying art — arguably its own form of gambling — and double-kissing that they lose track of time or what’s happening outdoors (in this case, gray skies and sporadic drizzle). That laser-focused quality was particularly true on Tuesday, V.I.P. 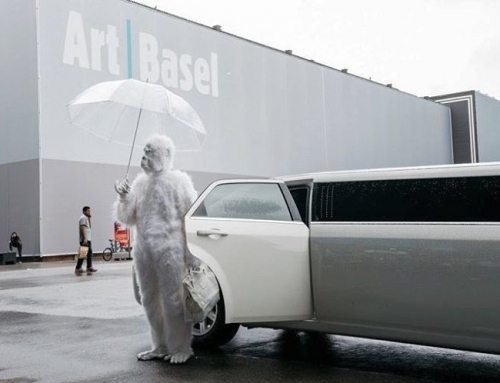 opening day at the fair, Art Basel 2016, when even boldfaced names were willing to wait in a long line in the rain to be first to sample the wares of more than 280 international dealers in the sprawling exhibition hall on Messeplatz. “I feel like I’m in Oklahoma in 1900,” said Richard Armstrong, director of the Guggenheim Museum, referring to the land rush there in the late 1800s. Some collectors would also rather consign their artwork privately, industry experts say, so that it won’t be shunned if it fails to sell at auction. The resulting bumper crop of good material, along with many items priced under $1 million, made for brisk sales even before the first hour was up (though gallery tallies must be taken with a grain of salt, since some pieces have been presold). Indeed, Dominique Lévy arrived without the centerpiece of her booth — a large canvas by the Russian artist Nicolas de Staël (1914-55) — because a collector bought it before the fair began. (She would not say who, or for how much.) Her gallery also sold its Frank Stella and its Alexander Calder, each for about $5 million. Jack Shainman, in the main part of the fair for the first time, sold Barkley L. Hendricks’s “The Twins” (1977) for $450,000; Kerry James Marshall’s “Untitled (Looking Man)” (2016) for $350,000; and Lynette Yiadom-Boakye’s “Peregrine” (2016) for $100,000. Some dealers tested demand by bringing high-priced items, like Sigmar Polke’s 1988 “Great Luck,” which David Zwirner sold to a private European collection for 6.5 million euros, or more than $7.2 million. Acquavella sold a 1964 Tom Wesselmann still life for $3.5 million; Mitchell Innes & Nash sold one from the same year for $2 million. Marc Glimcher, the president of Pace, proudly showed off the section of his booth devoted to Julian Schnabel, whom the gallery just started representing again. “This is how you relaunch an artist,” Mr. Glimcher said, referring to the walls covered by Mr. Schnabel’s new series of purple paintings, priced at $375,000 each. “This is Julian 3.0,” he said to Edward J. Minskoff, a real estate developer and collector who passed through. “You can feel that people are coming here to buy art,” he said. There was life — and art — outside the main exhibition hall, namely the highest number of installations (88) in the fair’s Unlimited sector, devoted to large-scale works for sale and located in a hangar-like space near the main fair. Curated for the fifth year by Gianni Jetzer of the Hirshhorn Museum, Unlimited offered a number of attention-getting pieces at the V.I.P. opening, including Hans Op de Beeck’s eerily monochromatic “The Collector’s House” and Davide Balula’s “Mimed Sculptures,” featuring performers in white uniforms and hot-pink gloves. The dealer Per Skarstedt said he had sold his Mike Kelley installation at Unlimited, 50 illustrations from the artist’s “Reconstructed History,” to an unidentified American museum trustee for $1.5 million. Nicholas Baume, the director and chief curator of the Public Art Fund, said he was particularly struck by William Pope.L’s performance at Unlimited’s opening, in which the artist wandered through the fair in a white gorilla suit before departing in a white limousine. “One of the things this fair can do is bring together galleries, curators and artists from all over the world and create some unique experiences,” Mr. Baume said. Across the Rhine on Rittergasse Street — seemingly a world away from blue-chip booths like Mr. Van de Weghe’s, with his Henry Moore and Magritte — the Tennessee-born artist Virginia Overton had installed a dismantled pickup truck in the Parcours sector of Art Basel, its collection of site-specific sculptures and performances. As it happened, the artist was present, having placed her truck piece before heading back to New York — she lives and works in Brooklyn — for the opening this week of her exhibition “Sculpture Gardens” at the Whitney Museum.